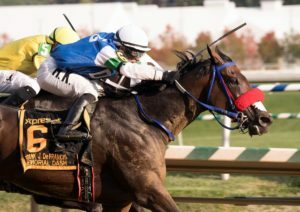 Linda Zang’s Lewisfield and Dun Roamin Farm and Wire To Wire Stable’s Irish Colonel, third and fourth, respectively, in the grade III Maryland Sprint Stakes May 19, are scheduled to return for the second race in their division, the $75,000 Mr. Prospector Stakes at Monmouth Park June 17. The six-furlong Mr. Prospector, part of the MATCH Series 3-Year-Olds and Up Sprint–Dirt Division, attracted a field of eight. In the grade III Maryland Sprint, Lewisfield, trained by Jeff Runco, encountered early trouble but still made a good bid thereafter, while Irish Colonel, trained by Cathal Lynch, ran evenly throughout. Arnaldo Bocachica, the only jockey to have ridden Lewisfield in his eight starts thus far, has a return call. Jorge Vargas Jr., aboard Irish Colonel for his last two starts, is named again. Lewisfield in his previous start won the restricted Not For Love Stakes at Laurel Park; Mr. Prospector entrant It’s the Journey finished a length behind in second. New Jersey-bred Chublicious, a graded-stakes winner owned by Brittlyn Stable, also is entered in the Mr. Prospector. An eight-time winner at Monmouth, the 7-year-old gelding finished second to Brother Chub, his full brother, in the restricted John J. Reilly Handicap in his last start in May. Brother Chub was nominated for but not entered in the Mr. Prospector. Chublicous, to be ridden by Antonio Gallardo, won the grade III Frank J. De Francis Dash at Laurel last fall, and the Reilly Handicap last summer. As a New Jersey-bred, he is eligible for a bonus based on total points at the end of the MATCH Series. Maryland-breds also are in the running for end-of-series bonuses, and there are three in the Mr. Prospector: Lewisfield; Hillside Equestrian Meadows’ Laki, who finished sixth in the Maryland Sprint; and It’s the Journey, who has two solid seconds and one third in stakes in his only appearances this year for owner Larry Johnson. 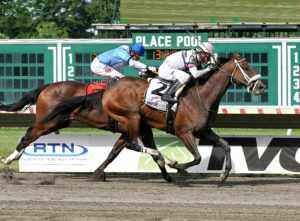 Brittlyn Stable’s venerable New Jersey-bred Chublicious took top honors in the $75,000 Mr. Prospector Stakes at Monmouth Park June 17 in his first MATCH Series event. Chublicious, a grade III winner last year, captured the Mr. Prospector Stakes (3-Year-Olds and Up Sprint—Dirt Division) and earned 10 points in his division. Chublicious, in his first start for Belmont Park-based trainer David Cannizzo, rallied from fourth early under Antonio Gallardo to collect his first win of the year after two second-place finishes in stakes. The 7-year-old Hey Chub gelding dueled with Lewisfield the length of the stretch and edged away to win by a half-length in 1:09.92 for six furlongs on a track rated fast. Linda Zang’s Lewisfield, a Maryland-bred who has never been worse than third in nine starts, took the lead at will from Delta Bluesman heading into the far turn and battled gamely for jockey Arnoldo Bocachica and trainer Jeff Runco. Lewisfield had two lengths on fellow Maryland-bred Laki, who rallied from last to third. It was the 11th win in 27 starts for Chublicious, who won the grade III Frank J. De Francis Memorial Stakes at Laurel Park last September. He paid $16.80 to win. The division leader after two races is Lewisfield with 12 points because he competed in both events held this far and placed second and third. Switzerland, who won the grade III Maryland Sprint Stakes May 19, has 10 points and is tied with Chublicious.